Please leave your baked goods in the school kitchen on the day of the event. We ask that your baking be done without nuts and nut oils as there are severe nut allergies at the school. Please include a list of ingredients with your baked goods. Healthy snacks are always welcome and we thank you in advance for helping out! Ø Students arrive to IRC at 6:15 pm and proceed to their classrooms. Ø All students may choose a festive outfit of their choice. Ø Students in IRC choirs will be wearing our IRC Choir vests. The Synervoice School Connects Automated Program Starts on Monday. Please phone in all absences/lates to the main office at 416-393-9025, option 1. Download your copy of the updated calendar here. Join the country in rallying support for RBC Sports Day in Canada on November 29 - a national celebration of sport at all levels. All fall sport teams and team members will be officially recognized at the Future Aces Assembly at 9:00am on this spirit day! The Power of Sport is "alive and well" at IRC! There was an incident with a Student who attends Annette Street Public School - please read below for further details. Download School Safety Tips here. Earlier today, we received information about an incident that was reported to have happened in our community. A 13 year-old student was approached by a man in a vehicle at Quebec and Annette at about 7:55 am this morning as she made her way to school. The man, who was one of three men in a white truck, asked the girl to enter the vehicle. The student did exactly the right thing in not responding to the man and quickly making her way to school, where she reported the incident to a teacher. We have contacted police and they are investigating. For your information, the person is described as male, white, in his late 20s to early 30s, average height, slight build, with a brown beard. He was in the rear passenger side of a white, 4-door truck. At the time of the incident, the man was wearing an orange vest over a white winter coat and had on a light-coloured hat. If you have any information that might assist police with its investigation, please call 416-808-1100 or contact CrimeStoppers anonymously at 416-222-TIPS (8477) or at www.222tips.com. The safety of our students is always a top priority. We are fortunate to have a number of initiatives, programs, and policies that contribute to a caring and safe school. However, most incidents happen away from school and outside of school hours. I want to emphasize to all our students, staff, and parents the need to be aware and alert at all times, no matter where you are and even in the most ordinary and everyday routines. Our staff periodically speak to students about how to stay safe and we did so again today. I know that you too will want to help ensure our community is as safe as possible. Attached, please find tips that you may find helpful when discussing safety with your child. Download the TDSB School Safety Tips here! The next IRC MOVIE NIGHT is coming up on thursday December 11. 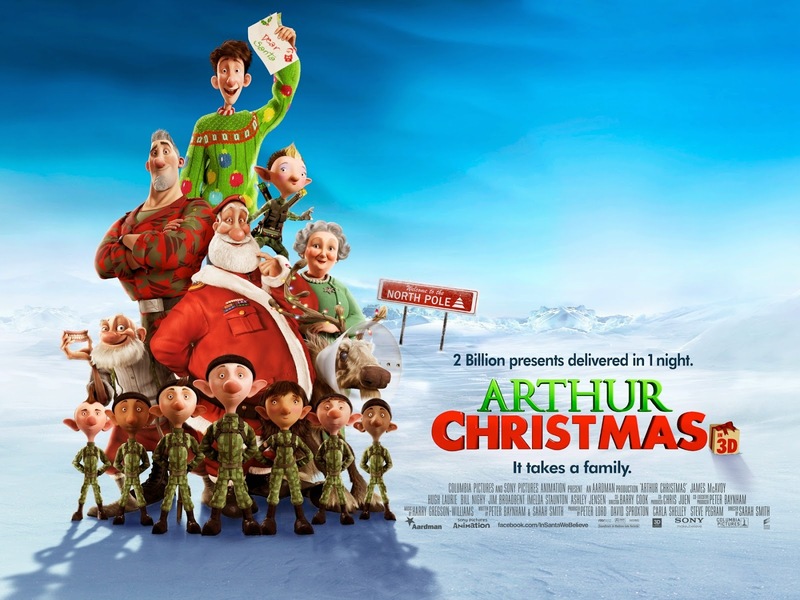 We'll be screening Arthur Christmas. Get in the sprit of the season and join us for a fun movie night in with your IRC family! IRC is in need of Volunteers to help with Pizza days, the Chess Club and the Movie night in December. If you are able to volunteer please contact Michelle Capon at michelle_capon@hotmail.com she will put you in touch with the right people. We are pleased to launch community consultations for the Toronto District School Board (TDSB) Draft Concussion Policy on Wednesday, November 26, 2014 at Lawrence Park from 6:00 p.m.- 9:00 p.m.
Dr. Paul Comper, clinical neuropsychologist and research scientist at the Toronto Rehabilitation Institute,and Dr. Michael Hutchison, Associate Professor and Director of the Concussion Program at the University of Toronto will be presenting the latest in concussion research. TDSB students will speak about their personal experiences and the Ontario Brain Injury Association will speak to services that they have available to enhance the lives of those living with the effects of acquired brain injury. We encourage community members to arrive early to explore the interactive information carousel for resources from Toronto Public Health, community sports organizations and Parachute Canada and provide us with feedback on the TDSB Draft Concussion Policy. As many of you know, the TDSB funding for school programming and supplies is very limited. As such, every year Toronto schools face chronic funding shortages and repair backlogs. Throughout the school year, the IRC and Parent Council organize a variety of fundraising initiatives to help us raise additional money for the school to help offset these shortfalls. We hope that you and your family will participate and give generously throughout the year, as every penny we raise goes back into enriching our school programs and purchasing badly needed classroom equipment and supplies. This in turn makes for a richer, more educational, and more memorable school experience for all our children. We will be updating information on all past and upcoming fundraisers and the money we raise, here on the IRC blog. IRC Parent Council is also in the process of setting a new and exciting fundraising goal for our Technology Fund and you will soon be hearing more about this initiative - stay tuned! Congratulations to our newly elected and re-elected TDSB Trustees. * Note: Following the resignation of Ward 10 Trustee Chris Bolton in June 2014, Briony Glassco was appointed Ward 10 Trustee, after on open application process, for the remainder of the term. Trustee Briony Glassco did not run as a candidate in the October 27, 2014 municipal elections. Time: 8 a.m. - 3:45 p.m.
Keynote Speaker: J. Richard Gentry, Ph.D.
J. Richard Gentry is a former university professor and elementary school teacher and author of Raising Confident Readers: How to Teach Your Child to Read and Write. He hopes to help bring back research-based spelling and writing in elementary school. Some of Richard's earlier books include Breakthrough in Beginning Reading and Writing and The Science of Spelling. Richard has degrees from the University of North Carolina Chapel-Hill and the University of Virginia. Bussing, child-minding and interpretation will be available through registration ONLY! For more information, please contact 416-397-3529. At the Board meeting on October 29th Trustees voted to terminate a controversial partnership between the Toronto District School Board (TDSB) and The Confucius Institute. In the past, TDSB Senior Kindergarten (SK) French Immersion information nights and the application process took place after the Christmas break. This year the TDSB decided to move the process to November-December to allow parents more time to sort out their family logistics and to allow more time to get staff in place for the following September. SK French Immersion information nights are taking place from October 29-November 27, 2014. Details here. Applications to start SK French Immersion in September 2015 will be accepted on-line from November 3-December 5, 2014 here. This is NOT a first come, first served process. However, parents must apply by December 5, 2014 to be guaranteed a spot in September 2015. Siblings of those already in the program also have to do the on-line application. Late applicants are given a spot only if there is extra space. Parents who are not on-line can ask for assistance at their home school office or from the FSL department. Very Important: the first step is for the parent to apply on-line. There is an immediate response from the TDSB saying the application has been received. In the weeks following the December 5 deadline, parents receive another email from the TDSB with details about the placement. In the second step, parents must respond to the placement email to secure the spot. Parents should check their email inboxes, including junk email, frequently during this time. Please share this information with friends, neighbours and family. 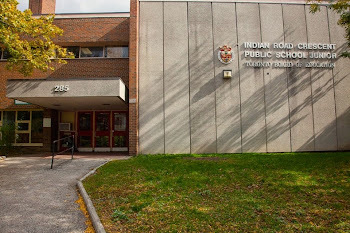 In November, we celebrate Aboriginal Education Month at the TDSB. This month provides an opportunity to re-examine how Aboriginal perspectives, histories and contemporary realities may be incorporated across the curricula, and to focus on treaties and the legacy of residential schools. At the TDSB, all students should feel supported, have a sense of belonging and feel respected and valued. Ensuring these values are at the core of Aboriginal education, a priority of the Years of Action. By infusing Aboriginal perspectives across curriculum in all areas, we want to create inclusive spaces for students to see themselves reflected as individuals and validated within the school community. Aboriginal education is not just for First Nations, Métis, and Inuit students, but for all students and staff. When non-Aboriginal people learn about the rich histories, cultures and contemporary contexts of diverse Aboriginal peoples, cross-cultural understandings occurs and a common commitment is formed, leading to equitable and more inclusive learning spaces. On October 30, the Ministry of Education announced that they will be moving forward with parent consultations around the Health and Physical Education (HPE) Curriculum, following through on their commitment to further engage with parents on this topic. Highlights from the news release pasted below. To see Background Information for Parents click > here. The timeline that lays out how the curriculum will be finalized and released is as follows. Due to many requests, as well as a recognition of the need to provide support, the Audit & Risk Management Department has developed training information sessions for School Council Executives. There are three session dates at three different locations for school council executives within WR1, WR4-WR7 families. Attached is a flyer that is to be shared with the council executives to provide them information on the sessions and to register. This is a great opportunity for the executives to get trained on Board Policies and Procedures, on developing a Non-Board Financial Plan, collecting and safeguarding cash, recording financial transactions and reporting financial activities. Allow me to use this opportunity to thank Lorraine Linton, Kelly MacDougall, and Dilawar Alvi, for arranging space to conduct the sessions. I hope these locations are convenient for the council executives to attend. Also, I thank all school and office administrators in sharing the information with their council members and encouraging them to attend. Registration is live for the 8th Annual Parent Involvement Makes a Difference Conference on Saturday, November 15, 2014 at Earl Haig SS, 100 Princess Avenue from 8:00 am to 3:45 pm. Workshops will run throughout the day and include topics such as: Building Skills in Reading and Writing; Family Storytelling; French … helping your child to succeed; and many more. There will also be an information marketplace that will feature an array of community agencies. Child-minding, interpretation, and bussing will be available through registration only. 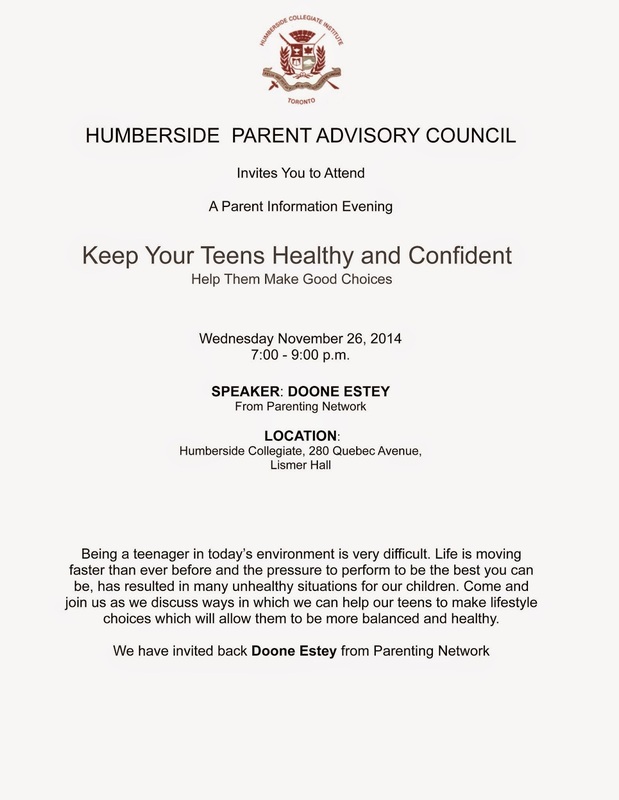 For additional information please visit www.tdsb.on.ca/parentconference. Annette St. PS is hosting Alyson Schaeffer on November 18th from 7-9. Join us for a free workshop Tuesday Nov 18 @7pm with leading parenting expert and psychotherapist Alyson Schäfer. Our second parent council meeting is coming up tomorrow (tuesday). It starts at 7pm - 8:30pm, and we generally stick to time. You can download the agenda for the upcoming meeting here.